Step back to 1954, before the St. Lawrence Seaway and diesel power ushered in the present age. Visit the CNR branchline division point at Lindsay, Ontario, positioned on the busiest grain route between Georgian Bay and Montreal. 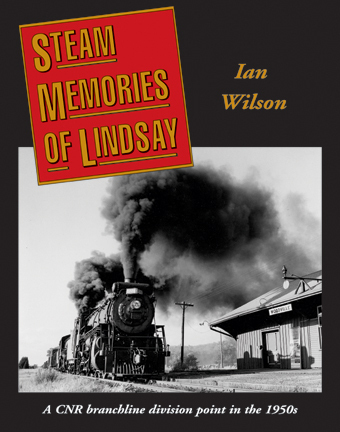 Witness the massive interaction between steam locomotives and steamships at Midland, king of the wheat and coal ports on the Great Lakes. Behold the constant parade of steam locomotives large and small at Orillia and Blackwater junctions. Watch Mikados wrestle with heavy stone tonnage from Kirkfield and Uhthoff. Climb aboard a mixed train and venture to the quiet cottage country at Coboconk, Haliburton or Howland. Signed for whom (if desired)?